At least eight people have died in one of the worst cold snaps to hit the US Midwest in decades. An Iowa student found dead outside a college building is among the victims. Hospitals have been treating patients reporting frostbite as life across a swathe of the country grinds to a halt. Ninety million people - a third of the US - have seen temperatures of -17C (0F) or below. Some 250 million Americans overall have experienced the "polar vortex" conditions. However southern states such as Florida have escaped the brutal chill. Thursday could see America's third largest city of Chicago breaking its 1985 record low of -32C (-25F), according to meteorologists. The city has already passed the record low for 31 January. The National Weather Service (NWS) announced Rockford, Illinois, west of Chicago, broke its all-time low record of -32C (-27F) when temperatures dipped to -34C (-30F) on Thursday morning. Cities across Iowa have also broken temperature records. Cotton, Minnesota, was the coldest place in the US on Thursday, however, with a low of -48C (-56F) based on preliminary data. The chill is drifting eastward on Thursday, bringing sub-zero temperatures to north-eastern cities such as Boston. Areas downwind of the Great Lakes are expected to be buried by intense "snow lakes" into Thursday night. On the icy streets of Chicago they are used to bitter winters but this was too cold even for some people who live here. Rush hour hasn't existed in this normally bustling city for the last couple of days as many have chosen to stay at home rather than brave such extreme elements. Those who did go to work arrived bundled up in layer after layer of clothing. Anything exposed - like eyebrows and lashes - were covered in frost. "They've frozen shut a couple of times", one man told me about his watering eyes. The Windy City could be renamed the Wind Chill City given the number of warnings there have been this week. Below several skyscrapers there are still signs pointing out the dangers of falling ice. 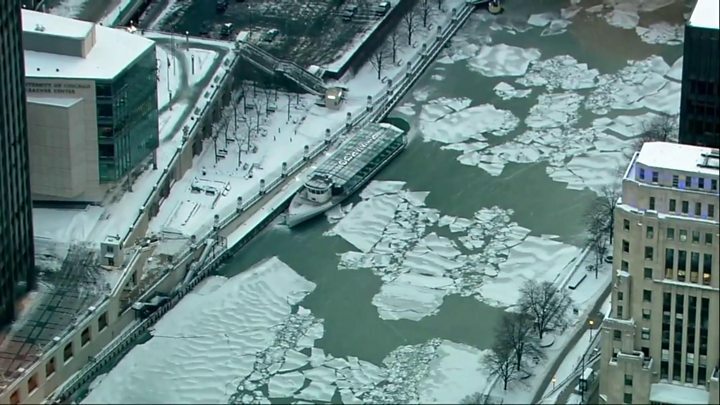 You could argue that a slight thaw has begun given that cracks have started to appear on what was a solid sheet of ice covering the Chicago river. 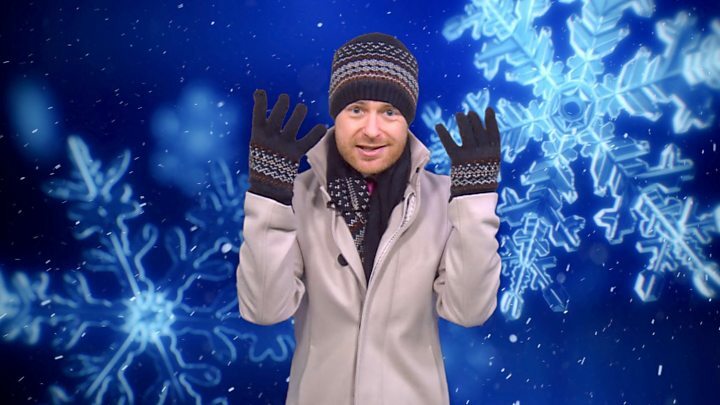 But temperatures are expected to remain below freezing until Saturday at the earliest. Native American tribes in the northern Midwest states have been helping their members obtain heating supplies during the chill as many live in poor-quality housing, the Associated Press reported. Detroit has had more than two dozen water mains freeze over this week. A city spokesman told the Associated Press the pipes were installed up to 1.8m below the frost line, but with such drastically low temperatures, the ground has still frozen through. More than 2,300 flights have been cancelled and another 3,500 delayed due to the polar vortex. As ice and snow continue to build up, roads have become increasingly dangerous across the northern US. In Illinois, police said they had assisted more than 1,300 motorists and received 460 calls in eight hours - 10 times the norm. One woman in the state was caught speeding at 115mph (185km/h) on a snowy road with a 35mph (56km/h) speed limit. Twenty-one vehicles, including a lorry, were involved in a pile-up in Buffalo, New York, during a snowstorm on Wednesday. Officials have not released details on any injuries, WKBW News reported. In Minnesota, prison visits were cancelled over the cold, according to the New York Times. The Illinois city became a frozen ghost town after temperatures fell to -30C (-22F), colder than parts of Antarctica. Salvation Army spokeswoman Jacqueline Rachev told the Washington Post: "It's a deadly situation for anyone. We're thrilled that someone was in a position to be able to do this." As the Midwestern city is one of the company's hubs, train services nationwide could be impacted. In Toronto, where winters tend to be milder compared to cities such as Montreal and Ottawa, temperatures had plummeted to -18C (0F). Icy roads and several transit delays made for a hellish commute for the city's residents. In Winnipeg, the capital of Manitoba, temperatures were -40C (-40F), with wind chill factors making it feel like -50C (-58F). "If you don't get it in December, you will get it in January or February or March. What do you expect? 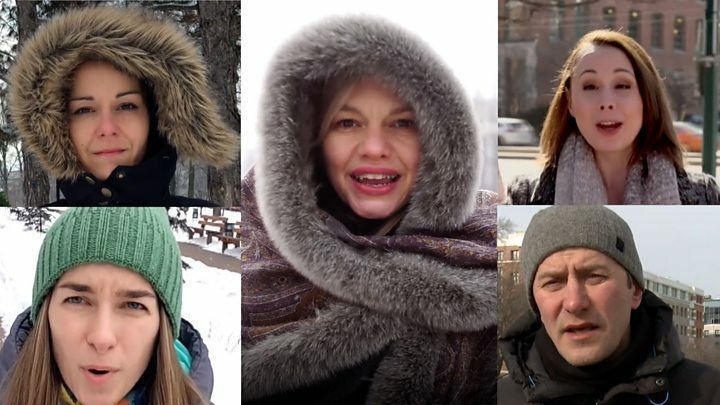 It's 'Winterpeg'," Caroline Rodriguez told CBC. In Calgary, Alberta, temperatures were a relatively balmy -3C (27F), but were expected to plummet overnight and through the weekend. Video So what actually IS a polar vortex…?